This year, my wife and I introduced our friends to the majesty of this quaint little festival. They loved it. Who wouldn’t? 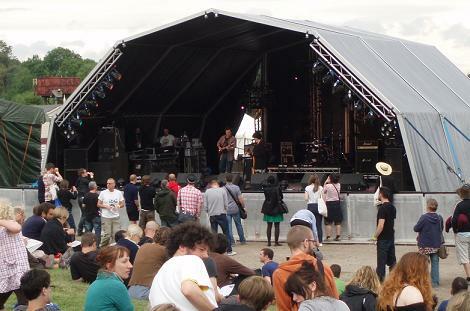 It’s five years since Derbyshire’s quaintest and most charming music festival first opened its gates. Back at its inception in 2007, Indietracks was more like just a unique gig in an engine shed at The Midland Railway Centre, a preserved railway near Ripley. Since then, the brainchild of Midland Railway Centre volunteer Staurt Mackay has steadily formed into a fully-fledged, well-run little festival that, whilst expanding considerably to meet increasing demands, has also managed to retain its intimacy and sense of togetherness. This year’s attendance is the biggest yet, with nearly 2,000 punters – including many regulars – enjoying the unique mix of international music, train rides, fine weather and a well-stocked bar. The festival’s set-up is now a standard feature and a huge pull for its target audience. There are bands playing in carriages whilst the steam-hauled train chugs along through idyllic Derbyshire countryside; the site’s restored tin tabernacle church also serves as a stage; workshops are scheduled to drum home its inherent tweeness, including fun lessons on button brooch making and cake decorating. It’s all so elegantly quirky and wonderfully sweet and pretty. Those who want a break from the music can visit the Centre’s heritage museum, which is packed with interesting railway-based facts, or take advantage of the unlimited train travel and marvel at the two exquisitely-detailed model railways they so lovingly maintain – one at Swanwick Junction, the main festival site, and the other at Butterley Station. But if it’s music you want, then it’s music you shall have. Lots of it in fact, starting on Friday night with three bands including Indietracks regulars Pocketbooks, the brilliantly-monikered Suburban Kids with Biblical Names who close the 1st day with their unashamedly twee Scandi-pop, and Jonny, a dreamy collaboration by indie legends Euros Childs of Gorkys Zygotic Mynci and Teenage Fanclub’s Norman Blake. Their lush harmonies and soft melodies sound perfect as the sun slowly sets. There’s plenty of sunshine on Saturday, too, ensuring that sun cream is slapped on, beer and cider is devoured, and picnics are eaten. The day’s highlights include Leodensian twee-pop four-piece Just Handshakes, Spanish fun-pop connoisseurs Guatafan, and a dose of avant-folk via cult Glaswegian 7-piece Butcher Boy, who provide some pathos betwixt the happy-clappy zeal. Meanwhile over in the engine shed, Greek indie stalwarts Next Time Passions are mangling Ride’s lolling shoegazing shtick with The Smiths’ achingly captivating misery. All goes swimmingly until Toronto’s The Hidden Cameras are due to perform their esoteric ‘gay church folk music’ to an expectant audience when the stage’s generator fails, forcing the two headline acts to be diverted to the engine shed. But the band aren’t prepared to give up that easily, and decide to treat a large crowd to an acoustic performance of a segment of their set. No mics, no gimmicks, nothing, but somehow it turned out to be the highlight of the day. They would go on to close the festival – fully powered up – after Edwyn Collins’s masterful performance in the engine shed. Despite suffering two strokes in the not-too-distant past, the indie legend is coherent, amusing and proof that life goes on regardless of what it throws at you. His set draws largely from his last album, 2010’s excellent Losing Sleep, but revives his classic Orange Juice hit, Rip It Up, and 1995’s chart-dominating pop nugget, A Girl Like You, which he ends with. With news of the problematic generator fixed on Sunday morning, and the promise of more good weather, Sunday is chill-out day. Although some might term it stoner day by virtue of the day’s American stoner-rock vibe dominating the festival, from Crystal Stilts’ haunting post-punk to anti-folk raconteur and post-modern American commentator, Jeffrey Lewis. And as Peel favourites Hernan Dune end the festival – save for the indie discos of course – with their ballsy and virile folk-rock, Indietracks’ fifth birthday bash has been another unmitigated success. Not even a dodgy generator could dampen its winning vibe. In the build-up to the festival the organisers asked its website visitors to succinctly describe the festival for its blog. One fan wrote: “It’s a festival where the music, people and atmosphere just make you want to smile”. That is Indietracks in a nutshell.